He's new! Jack Asteroid Cosmic Radiation edition has been up in the OuterSpaceMen.com Shop since Friday for $25.00. Order yours here. Orders are now open for Cosmic Radiation Ohpromatem! 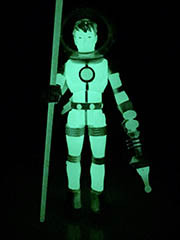 The glow-in-the-dark figure is $25 plus shipping. Several other new figures are also up for grabs, so you can order yours right now and presumably get them all at once to save on shipping. Now Available - Zero Gravity! New now! Zero Gravity is up at TheOuterSpaceMen.com for $30. 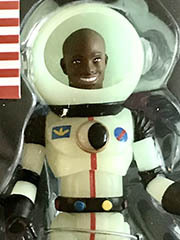 Presumably, orders ship soon - I'm looking forward to mine, and I hope the glow-in-the-dark astronaut gets here soon.